Ron Shaich – the millionaire founder and CEO of the Panera Bread chain – is currently attempting to live on just $4.50 a day as part of a campaign to show what it’s like for the millions of Americans who depend on food stamps. Ron Shaich, a keen advocate of large corporate giving back, started his low budget food shopping challenge on Saturday and has committed to doing to for an entire week. His effort is part of the SNAP (Supplemental Nutrition Assistance Program) Challenge, designed to raise awareness that “nearly 48 million people receive food stamps and 16 million children go to bed hungry”. As well as the millionaire businessman, 26 members of Congress – all democrats – are also trying to live on $4.50 per day. Blogging about the challenge on LinkedIn, Ron Shaich wrote about the difficulties of trying to buy healthy food on a weekly budget of $31.50. 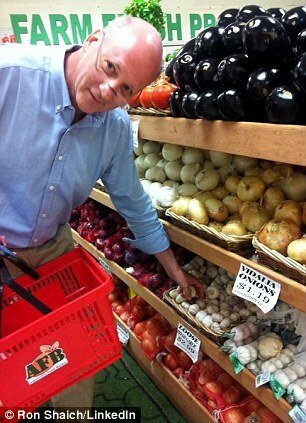 To make his money stretch as far as possible, he visited an NSA Supermarket in Dorchester, Massachusetts, to pick up food in preparation for the challenge. Ron Shaich writes that he soon learned he was going to have to forgo meat, fruit, vegetables and his favorite granola and instead load up on filling, carb-heavy foods. In total, Ron Shaich spent $25.95 – mainly on pasta, lentils and chickpeas – leaving him with just $6 for the rest of the week. He admitted there’s a good chance he’ll use his remaining amount on a sugar fix at some point during the week. “This isn’t going to be easy. In fact, it’s going to be incredibly hard,” he wrote last Friday. The House of Representatives could vote this week to cut the Supplemental Nutrition Assistance Program, also known as food stamps, by 5.2%. That would mean up to six million Americans would be forced off of food assistance, according to the Center on Budget and Policy Priorities. Ron Shaich says his intention is not to “trivialize anyone else’s experience” but merely to help spread a deeper awareness of America’s growing food instability problem. His restaurant chain is a $3 billion-a-year business with some 1,600 outlets in the U.S. but at five of those cafes customers are able to pay whatever they choose for what they eat. The unusual concept is part of an initiative by the company to help some of the millions of Americans who can’t afford to eat on a regular basis. When the cashiers take meal orders, they hand receipts to customers which show how much the food would normally cost, and then the customer decides how much to leave in the box or to take off their credit card. The first cafe opened in the St. Louis suburb of Clayton in May 2010 and since then four others have opened in Dearborn, Portland, Chicago and Boston. Between then, these five cafes are expected to serve more than a million people in 2013. The concept of a pay-what-you-can restaurant isn’t new, but Panera is the first major corporation to do it. Ron Shaich thinks other major companies should start to do the same. “Home Depot has the capability of helping after major storms. The Gap could run thrift stores,” he told Quartz earlier this year.